This Jewish Socialists’ Group conference,saddened by the deaths of Gilad Shaarh, Naftali Frenkel and Eyal Yifrah,and of Yussef Abu Zaghah, 16, from Jenin", and Muhammad Abu Khdeir, 16, expresses condolences with their parents, but condemns the Israeli military’s pre-planned operation, amounting to collective punishment of Palestinians in the West Bank. This could not bring back the boys, and has only worsened the circumstances of oppression, hatred and conflict to which both Israeli and Palestinian children and young people fall victim. We salute our friends in Gush Shalom and other groups who despite the tense atmosphere demonstrated outside the Ministry of Defence against this operation. The background to these events, and the renewed assaults on Gaza, is the Israeli government’s lack of interest in peace, demonstrated in April by its announcement of 700 new settlements, and refusal to release Palestinian prisoners. The collapse of US-sponsored peace talks strengthens the case for effective pressure to change Israeli government and policy. As Jewish Socialists we must welcome dissent with Israeli policy among our own community, foster links with those in Israel striving for alternatives, and work with others broadly sharing our vision of peace and justice. This JSG conference also expresses concern at the continuing agony and destruction in Syria and Iraq, and repression in Bahrain and Egypt. We express our sympathy for all the peoples of the Middle East, our opposition to reilgious sectarianism and reaction, or imperialist intervention, and our solidarity with those such as labour and women’s movements struggling for progress, secularism, democracy and a better future. 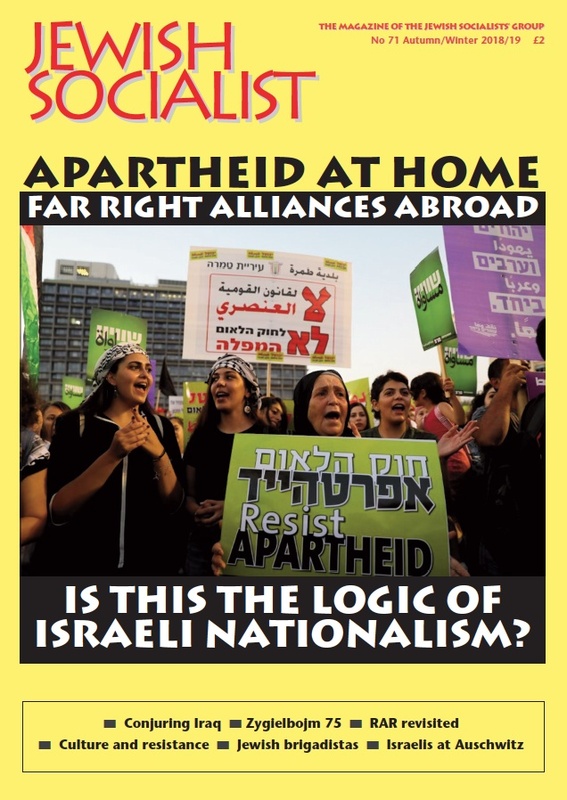 Apartheid at home – far right alliances abroad. Is this the logic of Israeli nationalism?